Skala Kaloni holidays offer relaxation in an area of great natural beauty. 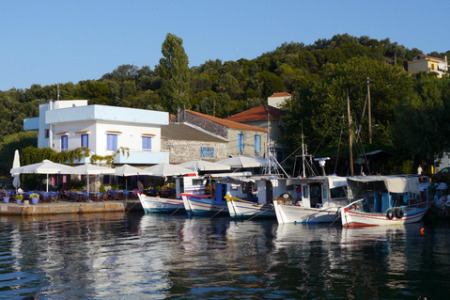 Although almost in the centre of Lesbos, it lies on a deep gulf that cuts into the island leaving it with sandy beaches and warm clear water. Holidays in Skala Kaloni have wide popularity with families enjoying safe bathing for children and couples savouring the peaceful beauty of the resort, while ornithologists and fishermen are overwhelmed by the numbers and species of their chosen pastime. The salt pans are filled with an amazing number of birds during their spring and autumn migrations. Holidays to Skala Kaloni can be taken from April until October when temperatures rise from twenty to low thirties at the height of the summer. We have a number of low cost Skala Kaloni holidays that are considered great value as our commitment to quality and service never falters. If you are looking for peace and quiet in stunning surroundings, with sun on your back and sand between your toes, you may be tempted by our cheap Skala Kaloni holidays. For further details and to find our latest Skala Kaloni holiday offers, please use the search facility.